Join Little Foot Yurts, makers of traditional style yurts in Wolfville, Nova Scotia, and learn the practical skills to start building your own yurt. Cost: $225 plus tax: Includes workshop fee, yurt camping, gourmet vegetarian meals & snacks, and a yurt zine. 15% discount rate for shared income couples. Dates & info: Look for listings on the yurtinfo.org calendar, and check the Little Foot website for the Workshop Brochure and Yurt Building Workshop outline. Little Foot Yurts can also lead a yurt building workshop for your youth group or community centre. Steve Place, of Handmade Hardwood Yurts, offers classes on constructing the Turkic traditional yurt and its lesser-known derivative, the Alachigh. Over five days you will learn all the details necessary for the construction of the yurt frame and Alachigh. The course is held in mid Wales and will be fully catered with delicious vegetarian food. Accommodation is in heated yurts. Cost: £300.00 for the five days and a small charge for wood if you wish to make your own wheel. Steve is the author of the CAT Factsheet “How to Build a Yurt”. Participate in a complete Yurt build, including steam bending your own roof crown. This one week course is designed to provide all necessary skills and information to build a yurt suited to our damp western climate. Four workshops will be offered in 2008. Rich can also travel to your location to lead a workshop for your group. Your group is invited to book a workshop with Coed Hills Rural Artspace to learn the techniques of yurt building from start to finish. General courses must be booked in advance with an adequate number of participants. Individuals who want to make their own complete yurts at Coed Hills must go through a proposal process, since building your own yurt takes a considerable amount of time and entails becoming part of the community during that time. The best dates to book a workshop are during pole cutting season, from October to March. That is when the trees are sleeping and it damages them the least. It is also possible to make covers at Coed Hills, and canvas stocks are on sale at £3 a metre. Cover-making workshops can be booked, or you may employ the onsite seamstress for covers up to 18ft in diameter. Tobias Fairlove & Sons in West Dorset, UK, offers weekend courses to build your own yurt. A six day course with Tim Hutton of Yurtworks, one of the longest running yurt making businesses in the UK. The course is spread over three weekends and covers three months. This provides time between sessions to work on your 12 ft or 16 ft yurt at home. Cost: £360 per person, includes lunch but not materials . Contact: The first course of 2008 is full. If interested in possible future courses, email [email protected] or phone 01208850670. A 4 day course led by Matt Boysons of Yurtshop yurts and Yurtopia yurt rentals. The course is structured to cover all the components of yurt construction and includes practice with tools used to produce a Yurt frame, as well as information on timber selection. You can schedule a yurt workshop for your group in Kyrgyzstan by contacting CASCA (the Central Asian Crafts Support Association). For the past few years, Rob Matthews of the Yurt Workshop in Spain has taken a group to Kyrgystan, where they worked alongside master yurt makers learning traditional yurt making using centuries-old techniques. The Dickinsons Reach Community leads yurt building workshops in which 8-15 people construct a simple yurt in 5-10 days. 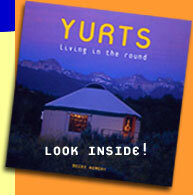 For more information on the Bill Coperthwaite and tapered wall yurts, see Chapter 3 of YURTS: Living in the Round. A six day yurt building workshop with Bill Coperthwaite at Medicine Circle, a nature awareness center nestled in the mountains of north Idaho. The workshop will build a tapered wall yurt to be used as a gathering space for future workshops. Join us for a six-day learning experience to build a tapered wall yurt. The yurt will serve as a writing studio for Karen Litfin, a UW professor who is writing a book on ecovillages. No experience necessary. Cost:$600 for the full six day workshop including housing in a large farm house or camping and all meals. 50% deposit required with registration. Partial participation may be accomodated. Inquire for low-income rates and work/study arrangements. Join us in October for this special 10-day yurt-raising at Margaret Matthewson’s Ancient Arts Center near Alsea, Oregon. William Coperthwaite has spent decades learning and documenting traditional craft around the world in the interest of finding simpler, more peaceful ways to live. His signature design is the multi-level, rigid-walled yurt, an adaptation of the traditional Mongolian yurt, or ger. Bill has led hundreds of handcraft and yurt-raising workshops and is the author of A Hand Made Life (Chelsea Green Publishing). Margaret Matthewson is a crafter, basket-maker, willow-grower, and martial artist. She teaches widely, both in university and other settings, and runs the Ancient Arts Center as a forum for teaching and learning a wide variety of skills and practices. In the workshop, we will practice hand-skills in carpentry, basket-making, and earthen plasters (wattle and daub) to make a two-tiered, rigid-walled yurt. The walls will be woven from willow withies grown and harvested on the property. Then we’ll plaster them with a combination of lightweight, insulative mud, finished with earthen and/or lime plasters. The roof will be a “living roof” planted with native plants and setums (depending on time and interest, we may build some ovens/stoves on the side). Please inquire directly for more information: 541-438-4300, or contact Margaret through ancientartscenter.com. COURSE FEE: The 10-day workshop costs $900, and includes meals, dorm bed or campsite. Some scholarships available.